Embedded within a centennial jungle, Hacienda San Jose, A Luxury Collection Hotel, is an original hacienda from the 18th century with expansive wild gardens and a swimming pool that floats over the jungle. After falling in ruins and overtaken by the jungle, it was lovingly restored as a truly unique and luxurious hotel. Today, guests can appreciate the hotel’s original sky-blue façades, exquisite decoration, and murals in its chapel and library. The original buildings are complemented by four Mayan Villas that serve as unique suites that provide an insight into the Maya heritage present throughout the region. 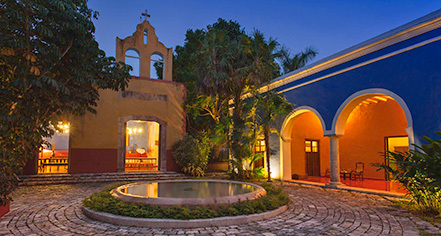 Hacienda San Jose, a member of Historic Hotels Worldwide since 2016, dates back to 1800. Hacienda San Jose was originally a self-sufficient farming and manufacturing center, specializing in livestock and corn. 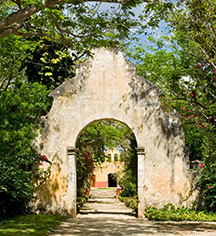 Learn more about the History of Hacienda San Jose, A Luxury Collection Hotel .